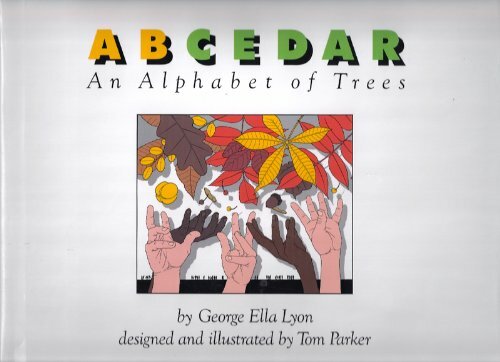 An alphabet book introducing the leaves from a variety of trees. 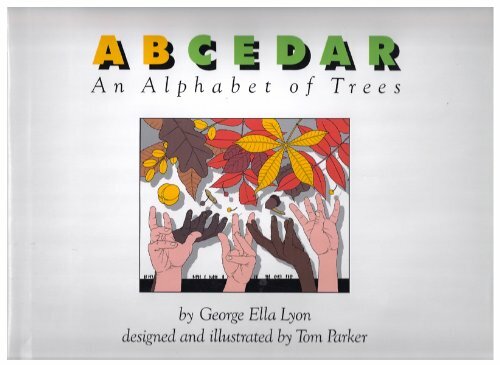 What at first glance appears a plain work soon reveals rich layers indeed: this is no mere abecederium. 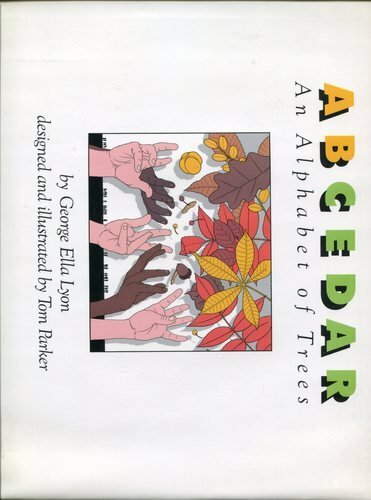 In fact, it uses the alphabet chiefly as the point of departure for a compact but copious introduction to 26 varieties of trees. A leaf and sometimes fruit from each are shown, in simple greens and yellows, against a human hand; below are delicate black-and-white silhouettes that depict the entire tree surrounded by figures. It is an ingenious graphic scheme, for, in crisp, uncluttered spreads, it conveys the shape and scale of both part and whole. At the same time, it leavens the information with animation and warmth, and even permits the possibility of story: observant readers will find intriguing details in the actions and interactions of the tiny silhouettes, which reveal families, backpackers, elephants, even a game of baseball in progress. A Richard Jackson Book. Ages 3-6.